Strong and durable corrugated totes hold up with repeated use. 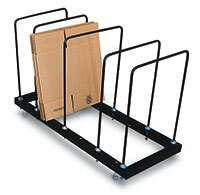 Easy-to-assemble totes have die-cut handles that make carrying easier. Totes are nestable for convenient storage. Ships flat to save on shipping costs.